Continental USA Prices for the 12-volt Swampy SpaceKoolr Models. Web Sale Prices on 12-Volt Models Delivered within the Continental USA. NOTE: All prices in US dollars and we only add sales tax when shipping to a Arizona address. The all new Low Profile 12-Volt MightyKool Model K2 (7 7/8" H x 10 1/4" W x 11 1/2" L) is self-contained, holding enough water to cool all night long. Add Water or even Ice, then plug the 10-foot power cord as it operates easily with either 12-Volts or 120/240-Volt power with optional AC/DC Convertor. Then move to where the cool air is needed. Consider using with the optional Air Intake Housing Kit. for maximum cool air. One set of (2) Smart Cooling Filters may be added for $14.00, saving almost 50%, as we pay shipping with any or all options when ordering the MightyKool K2. *For delivery in the Continental US only. Add $60 to $80 for delivery for most models to other US States, Territories and Canada. Add $100 for delivery to most other areas of the World because of Transportation & Distribution. Duties and any applicable Taxes are the customers responsibility except Arizona. Dual use Air Conditioner/Evaporative Cooler for use in Humid or Dry Climates as the MK3 contains the advanced chiller system comprising a heat exchanger as well as the evaporative cooler capabilities. Comes complete ready to cool except for the ice chest. Operates easily with either 12-Volts or 120/240-Volt power with optional AC/DC Convertor. One set of (2) Smart Cooling Filters may be added for $14.00. Dual use Air Conditioner/Evaporative Cooler for use in Humid or Dry Climates as the MK4 contains the advanced chiller system like the MK3 comprising a heat exchanger as well as the evaporative cooler capabilities. Comes complete with Four cool air Vents ready to cool except for the ice chest. Operates easily with either 12-Volts or 120/240-Volt power with optional AC/DC Convertor. One set of (2) Smart Cooling Filters may be added for $14.00. The most powerful Dual use Air Conditioner/Evaporative Cooler MightyKool Model for use in Humid or Dry Climates as the M400 contains the advanced chiller system comprising a heat exchanger as well as the evaporative cooler capabilities. Comes complete ready to cool with the ice chest and no assembly needed. Operates easily with either 12-Volts or 120/240-Volt power with optional AC/DC Convertor. One set of (2) Smart Cooling Filters may be added for $14.00. *For delivery in the Continental US only. Add $40 to $60 for delivery for most 12-Volt models to other US States, Territories and Canada. Add $100 for delivery to most other areas of the World because of Transportation & Distribution. Duties and any applicable Taxes are the customers responsibility except Arizona. **The following Options available with Free S/H with the original order. However if more than (1) Set of Smart Cooling Filters are selected it may result in additional S/H. The Single Smart Cooling Filter should be changed every few hundred hours of use for maximum cooling. Save almost 50% by ordering a set with your order of any Model. 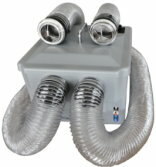 The Air Intake Housing Kit especially developed for use in non-moving vehicles for Sleeping, Pets, etc. for the MW1 and all previous WIN3 models, **$49.00 plus add $10 for International Orders. *For delivery in the Continental USA only. Add $40 to $80 for delivery for most models to other US States, Territories and Canada. Add $130 for delivery to most other areas of the World because of Transportation & Distribution (with the exception of the M300 as there will be an additional bulk shipping charge. Duties and any applicable Taxes are the customers responsibility except in Arizona where we collect sales tax when shipping to Arizona Addresses. Have Questions or Comments? CONTACT US to receive an answer soon.